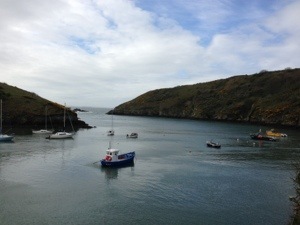 From Solva to St David’s. Today is another hiking day, so we took the bus down to Solva, which is one of the most beautiful little fishing villages in Pembrokeshire, hidden away up a secluded inlet, which is the River Solva estuary. The village nestles in a deep, steep valley and is made up, typically, of quaint little cottages lining very narrow streets, with a handful of craft & antique shops, restaurants, pubs & cafes. 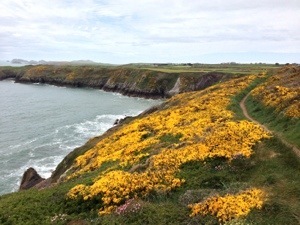 The coastal path starts from the car park lining the harbour and climbs up gently on to the cliffs affording fantastic views down to Solva harbour and out to sea across the break-water, where the sea tells a different story about the weather conditions. As the cliff tops approach, the sea state beyond the inlet confirms the winds now buffeting us. However, the wind is no longer as strong as two days ago. 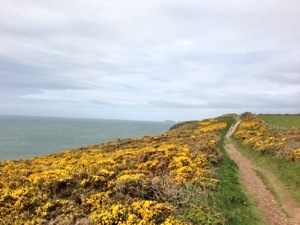 The theme of the path today, besides the usual dramatic views and cliff drops, are the intense yellow Gorse bushes covering the route like a prickly protective blanket. The path is easy to moderate, only a little more challenging when we have to drop to sea level to cross a cove and climb back up the other side. We break a couple of times for lunch and Welsh pony feeding but besides that we make good progress and soon reach our junction with the road at Caerfai Bay. Here, we head inland back to St David’s and the hotel. After a quick freshen up we head into the centre of St David’s for a proper look at The Cathedral, Bishop’s Palace and some of the local shops & galleries. The setting of the Cathedral is magnificent and quite unusually on a sloping site below the city. This means that from afar The Cathedral can’t always be seen. 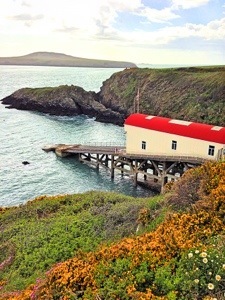 Our final task for the day before dinner is to take a trip to St Justinian and view the famous Lifeboat Station, which has been around since the early 19th Century. It must be extremely exhilarating to be hurled in a large lifeboat from such a height down a ramp into the sea. Thank you to the 40,000 members of the R.N.L.I. that have been saving lives at sea around the coast of The British Isles since 1824.